Uri Scheft draws on his own travels and Israelis' childhood flavor memories in his new baking book, which ranges from Yemenite kubaneh to European marzipan in everything. He had a B.A. in biology and no idea what to do with his life. Traveling the world, it was in the heart of India that 27-year-old Uri Scheft realized he wanted to be a baker. As a kid, Scheft would spend his afternoons in his mother’s kitchen, watching her prepare food for the family and baking challah for Shabbat. “In short, I was interested in my mother,” more than he was in the food, he admits half jokingly. 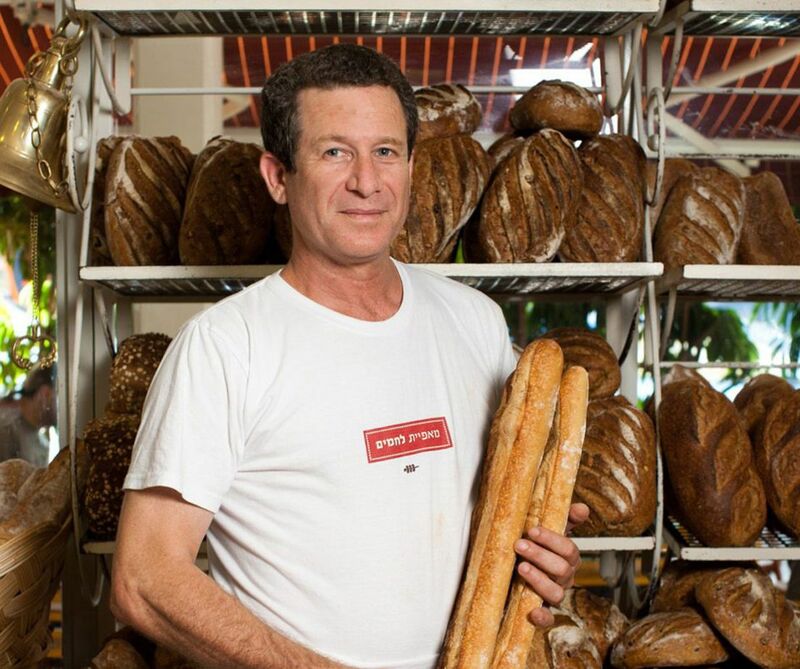 Scheft spent years studying and interning (in Denmark, France and Italy) before founding the successful Breads Bakery (Lehamim in Hebrew), which has six branches in Israel and three in New York City. Now he is launching a new project, his cookbook “Breaking Breads: A New World of Israeli Baking” (Artisan, scheduled for publication October 18). Scheft received the first copy of his book only a few weeks ago and is slowly realizing how much he loves it. The beautiful book, with photographs by Con Poulos, provides a thorough look into the many influences that have shaped the world of Israeli baking. The book is full of enough details and photos to encourage even a novice baker to bake his black-tie challah, tapenade brioche snails or babka – a babka many swear is the best in New York City. The selection of recipes in the book represents Scheft’s background as an Israeli with Danish roots, married to an Israeli woman of Yemenite and Moroccan descent. He is a well-traveled baker who crisscrossed the world, first in search of his professional destiny and then for inspiration for his book. This fusion story, so typical of Israelis of this generation, does indeed represent the world of current Israeli baking. Recipes include Yemenite kubaneh, a traditional Sabbath bread of rolled dough that’s baked overnight in a tin pot; Israeli-style burekas, a puff-pastry variation on the Turkish burek; a Palestinian style bagel that’s popular in Jerusalem: and a variety of flat breads like pita. The cover of the Breads Bakery cookbook. 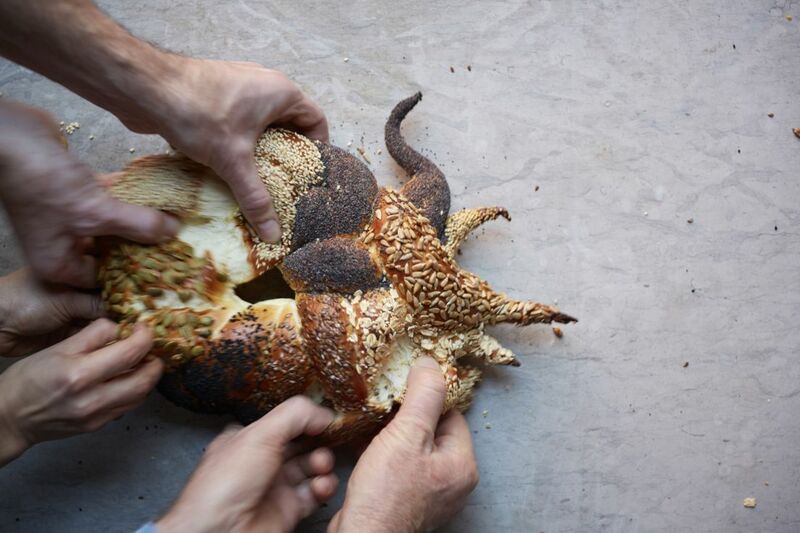 “Breaking Breads: A New World of Israeli Baking” by Uri Scheft (Artisan Books). Copyright © 2016. Photographs by Con Poulos. Scheft’s Danish roots explain the extensive use of marzipan in recipes like marzipan challah, and pistachio and marzipan pull-apart rugelach; sweet pastries with a strong Hungarian influence, such as poppyseed yeast roulade, chocolate rugelach, and Nutella babka. This famous babka is made with Nutella in New York, but in Israel is prepared with Hashachar, an old Israeli brand of chocolate-flavored spread with hardly any real chocolate in it. This is because Scheft is a strong believer that “when it comes to food, what works on us are childhood flavor memories.” So in Israel, he chose the less fancy, but very familiar chocolate spread that every Israeli kid got in his lunchbox sandwich. Besides this minor difference, and some adjustment in types of flour (pastry versus all-purpose), Scheft’s exact recipes and menus from Israel are used in New York. And now New York is starting to influence him back. The proximity to Union Square Market determines what goes into sandwiches and on focaccias (evident in the book as well), and the many sushi places around the city gave Scheft the idea to try serving raw fish with focaccia. The bakeries, in both New York and Tel Aviv, now sell large individual cookies, something common in the United States but unusual in Israel. When asked about the difference between Israeli and American costumers’ tastes, Scheft commented, “I’m not in America, I’m in New York.” But all joking aside, what works in Israel also works in New York City, he said. In both locations, the tuna salad sandwich is the most popular menu item, he added. Excerpted from the "Breaking Breads" cookbook. Why make one challah when you can make three? Many of the recipes in this book produce more than one loaf of bread or babka because the result you get when mixing a large batch of dough is actually much better than what you get when making a small batch. With a good amount of dough in the bowl, it is easier for the mixer to do its job and properly knead it. Challah freezes beautifully – you can freeze a loaf whole, or slice it and then freeze it for toast or French toast. Or have one loaf for dinner or breakfast, and give the other loaf to a friend or someone close to your heart. The offer of fresh-baked bread is a beautiful gesture that is better than any bottle of wine or store-bought hostess gift. 4. Stretch and fold the dough: Lightly dust your work surface with a little flour, and use a dough scraper to transfer the dough from the mixing bowl to the floured surface. Use your palms to push and tear the top of the dough away from you in one stroke, and then fold that section onto the middle of the dough. Give the dough a quarter turn and repeat the push/tear/fold process four times. Then push and pull the dough against the work surface to round it into a ball. 5. Let the dough rise: Lightly dust a bowl with flour, add the dough, sprinkle just a little flour on top of the dough, and cover the bowl with plastic wrap. Set the bowl aside at room temperature until the dough has risen by about 70%, about 40 minutes (this will depend on how warm your room is – when the dough proofs in a warmer room it will take less time than in a cooler room). 7. Shape the dough: Set a piece of dough lengthwise on your work surface. Use the palm of your hand to flatten the dough into a flat rectangle; then fold the top portion over and use your palm to press the edge into the flat part of the dough. Fold and press 3 more times – the dough will end up as a cylinder about 7 inches long. Set this piece aside and repeat with the other 8 pieces. 9. Pinch the ends of 3 ropes together at the top (you can place a weight on top of the ends to hold them in place) and lightly flour the dough (this helps the pieces stay separate instead of fusing together during baking). Braid the dough, lifting each piece up and over so the braid is more stacked than it is long; you also want it to be fatter and taller in the middle, and more tapered at the ends. When you get to the end of the ropes and there is nothing left to braid, use your palm to press and seal the ends together. Repeat with the remaining 6 ropes, creating 3 braided challahs. Place the challahs on parchment paper–lined rimmed sheet pans, cover them with a kitchen towel (or place them inside an unscented plastic bag), and set them aside in a warm, draft-free spot to rise until the loaves have doubled in volume, about 40 minutes (depending on how warm the room is). Mamoul is like the falafel of cookies. 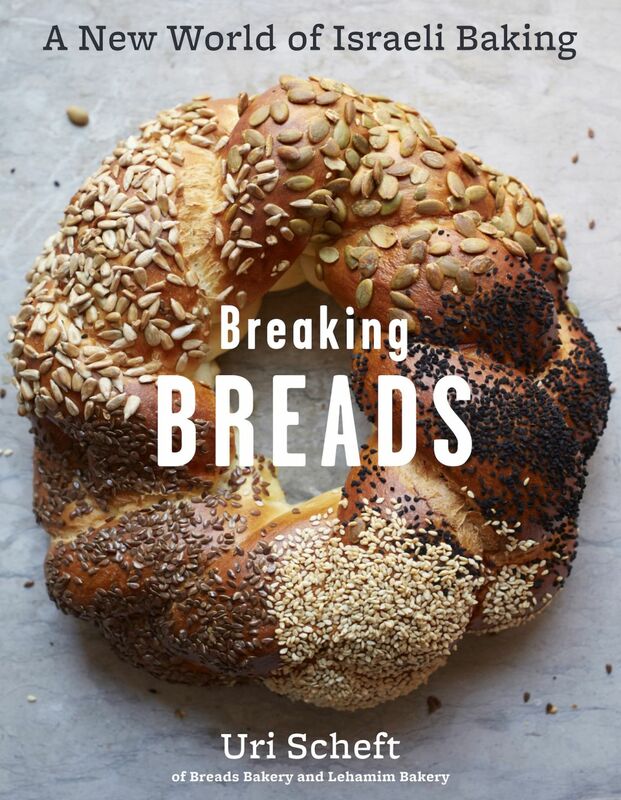 “Breaking Breads: A New World of Israeli Baking” by Uri Scheft (Artisan Books). Copyright © 2016. Photographs by Con Poulos. Mamoul is like the falafel of cookies, at home in Jewish kitchens and Muslim ones, served at Rosh Hashanah or Ramadan and sometimes even as an Easter sweet. It is a semolina cookie that is sometimes stuffed with a date paste or walnuts or pistachios. The dough surrounding the filling is shaped and pinched, or sometimes the cookie is pressed into a mold to decorate the surface with ridges and grooves. They can be domed or flat, and they keep very well for more than a week in an airtight container. 1. Make the mamoul dough: Pour the water and oil into the bowl of a stand mixer fitted with the paddle attachment. Add the flour, semolina, sugar, baking powder, vanilla seeds, neroli oil and salt and mix on low speed until combined, about 30 seconds. With the mixer on medium-low speed, begin to add the butter, 1 tablespoon at a time, waiting a few seconds before adding the next bit of butter. Continue to mix the dough until it is smooth and of one consistency. 2. Transfer the dough to a large sheet of plastic wrap and press it into a rectangle about 1 inch thick. Wrap the dough well in the plastic wrap and refrigerate for 2 hours. 3. While the dough chills, make the date filling: Place the dates, oil, hot water, cinnamon, and cardamom in a medium saucepan and stir over medium-low heat until the mixture is sticky and jammy. Add the walnuts and stir to combine, then transfer the mixture to a bowl and set it aside to cool. 4. Pour a few tablespoons of oil into a small bowl and use it to lightly grease your hands. Scoop up a large-marble-size portion of the date mixture and roll it between your palms into a ball. Repeat; you should end up with about 35 date balls. 6. Adjust one oven rack to the upper-middle position and another rack to the lower-middle position. Preheat the oven to 325°F. 7. 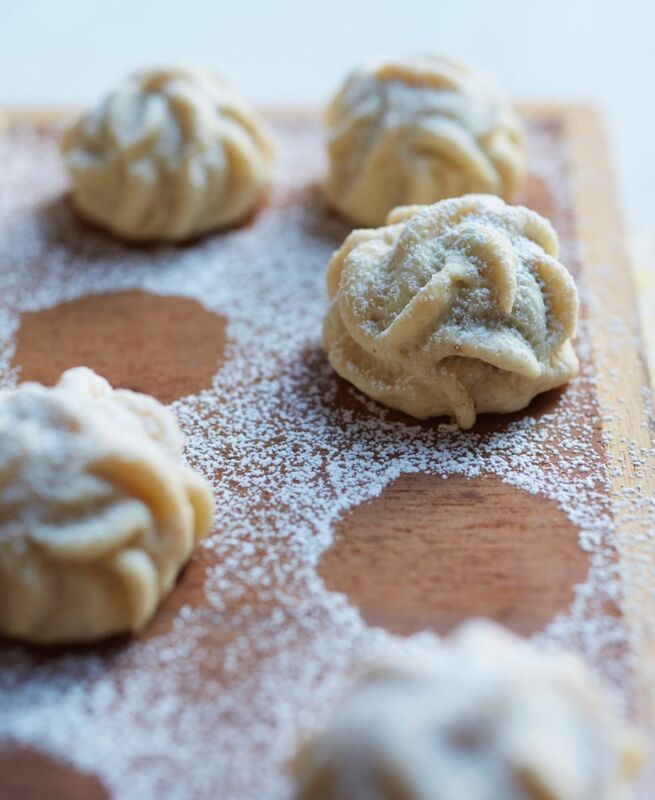 Use a fork or a dough crimper to create a pattern on each mamoul (dip in flour each time to prevent the fork or crimper from sticking; if the dough becomes too sticky, refrigerate the balls until they are once again easy to work with), or pinch the dough to create fluted, crimped ruffles. Divide the mamoul among 2 parchment paper–lined sheet pans and bake, turning the sheets and rotating them between the bottom and top racks midway through, until the bottoms of the cookies are golden and the tops are baked but not browned at all, about 10 minutes. Remove from the oven and let the cookies cool completely on the pans before dusting them with confectioners’ sugar.